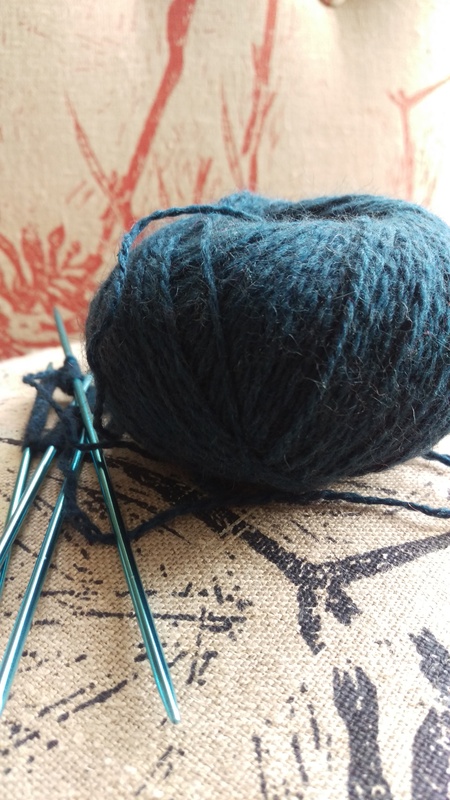 Trying to be thoughtful about sock yarns in a period where I knit socks constantly and quite quickly has led to all manner of interesting insights. This post introduces another. At present it is not an option for me to leave home without a sock in progress. I’m spending a lot of time on public transport–which is good, but requires management. I go to a lot of meetings and presentations–which is sometimes good and sometimes challenging. Socks help me! 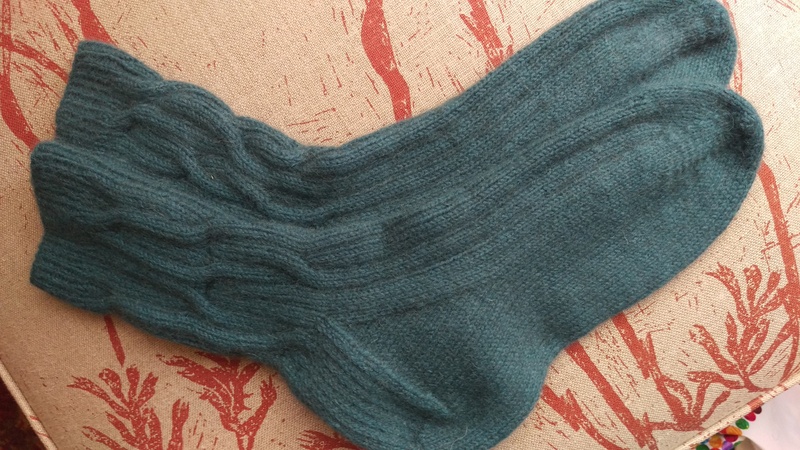 The tuffsocksnaturally project has been one great outcome of trying to move in an eco-friendly direction–and I have sock yarn spinning to show! However, creating sock yarn involves slowly spinning (I can’t take that on the bus! ), dyeing, washing and converting skeins to balls. All of which is pleasurable time spent but certainly does take time. 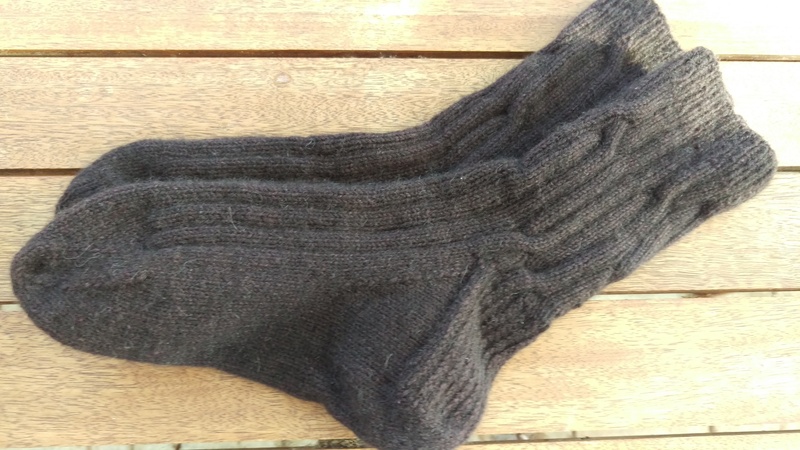 In the case of my Suffolk adventures, I also need to be confident the intended recipient will enjoy and be able to comfortably wear the resulting socks, which requires some chat. 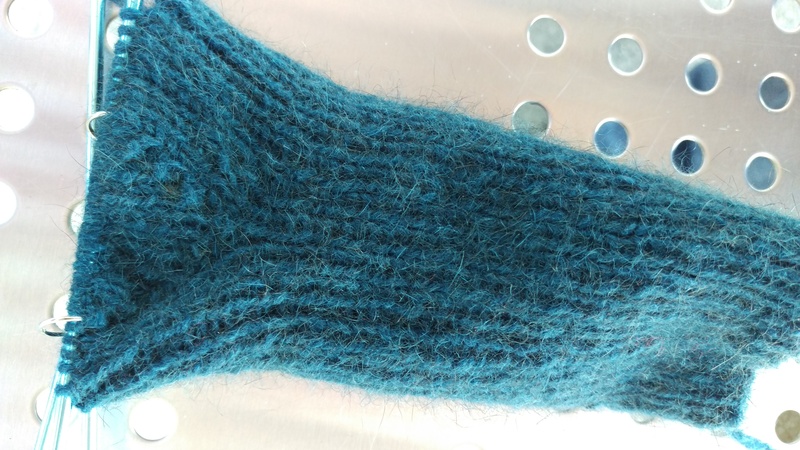 BUT: if there is some point where I do not have a handspun sock ready to knit and I reach the end of my current pair–I need a plan! A while back, I went to a two day meeting in Parramatta, which is now part of greater Sydney. The tree and the sculpture are images from my roaming around in the few daylight hours I had outside a meeting there. As I prepared to leave for an entire two days of meeting, with airport waiting, airtrain trips, waiting in train stations, and who knows what kind of night in a hotel, I ran out of sock yarn. So I decided to knit leftover yarns in the same colour family into socks. Yes, dear Readers, I am blessed with friends who have said to me “just knit up whatever you’ve got! I’m not bothered if you use up your scraps” or, when I asked another friend if he fancied socks that were knit this way, said that sounded like fun. To me this sounded a lot more attractive as a knitting project than some of the patterns I see popping up from time to time directed at people like me who have knit a lot of socks and have leftover sock yarns (some of which go to the recipient so they can darn in the future but some of which stay with me). And that is how one of my friends came to get these socks, which were received with a squeak of glee! We spent the holiday period with my beloved’s entire family, three generations of it. I took plenty of knitting… and the beanie department of holiday knitting included a skein of handspun possum/wool blend and some eucalyptus dyed wool for contrast stripes. The possum/wool appeared in my friend Joyce’s stash and came to my house when she was moved into a nursing home by her family. Since last I wrote she has died, aged 92. So there has been grieving to be done as well as the certain recognition she was living a mercifully short stage of her life that she never would have chosen for herself. In the top picture, casting on while enjoying sushi with one of my beloved’s nieces–that family have embraced me in a truly lovely way and it”s privilege to be among them. Then in the second image, this is a family who love to play scrabble in a manner entirely different and far higher scoring than anything my family have ever done, and if you look closely I’ve improvised a stitch marker from the spring of a peg. The other one might have been an elastic band. Needs must! The kind of distracted knitting done while playing scrabble goes well with a little nudge about when to decrease. The recent period of incapacity and pain has somehow led to an outbreak of hats. I was talking it over with a considerably older friend whose mobility is now quite restricted and whose everyday life has become a challenge in its own right. 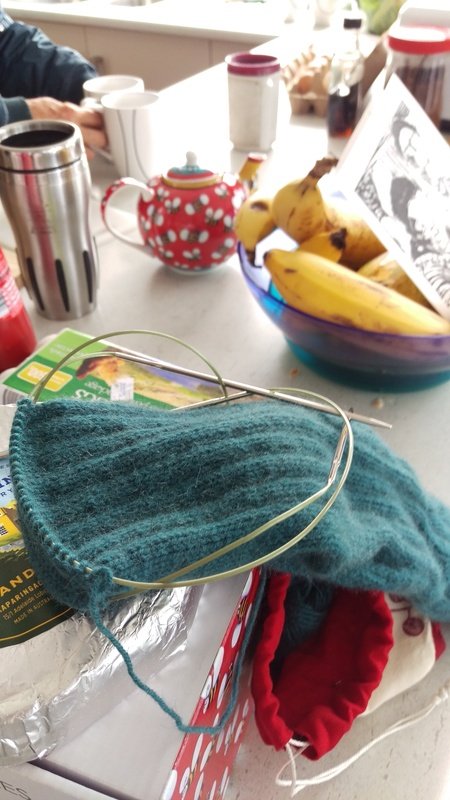 Formerly a proficient and very adventurous knitter (when I first met her she was knitting an extremely complex cabled jumper in a traditional style), she has been knitting the same hat over and over for the last few years. When I said to her that I had been feeling as though perhaps I just didn’t have the mental space to attempt anything more complex than a beanie and then another beanie, she said that was how she felt. First there was this. It is closer to Jared Flood’s Turn A Square than any other I have made more or less following the pattern, but it’s handspun and the colour change in the yarn turned out to be almost at the crown! Then there was an alpaca-dyed-with-eucalyptus hat. Then I knit up a ball of possum wool that remained from a trip to Aotearoa/NZ. But somehow the casting on kept happening… in this case oatmeal corriedale hand dyed by The Thylacine and spun into yarn by me, cast on on the train. And pretty soon, there was a pile. 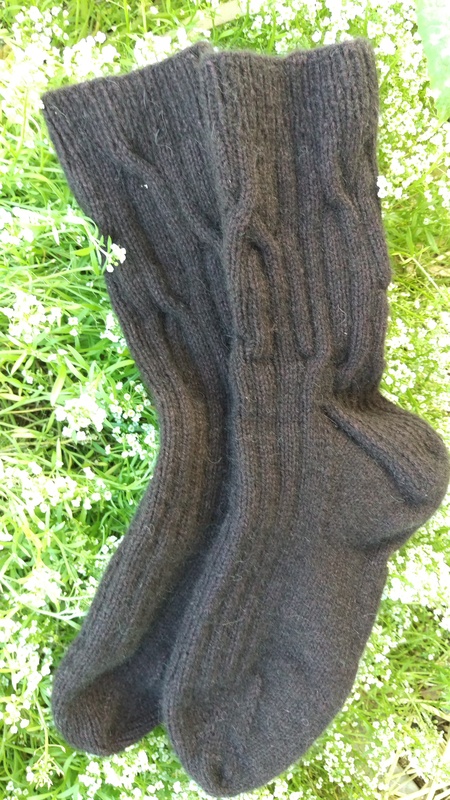 Suri alpaca… oddments of eucalyptus dyed wool, two colours of eucalyptus dyed + naturally black alpaca, corriedale! It was about then that the colour work began: a sign that the pain has been abating and also that the casting on keeps occurring. It’s great to have whisked through some of the small quantities in my stash, and it is also a happy thing that the cold weather has arrived and we are going to a shed warming where many people with all kinds of head sizes and tastes and tolerances for fibres will be there. I can feel a beanie giveaway coming on! These socks, made from possum wool purchased in Aotearoa/New Zealand, began slowly and suddenly leapt forward when I travelled to Sydney for a family occasion and then a holiday in December. 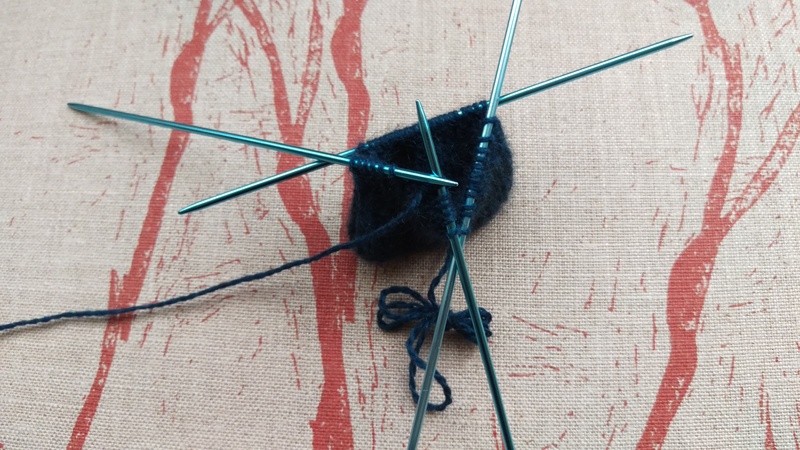 I think the slowness was due largely to the loss of the previous sock in progress, needles and all. It somehow made me feel like I might be losing my capacities in some way, rather than seeming like an unfortunate accident. I can’t say why I adopted this kind of interpretation but I hope to get over it! 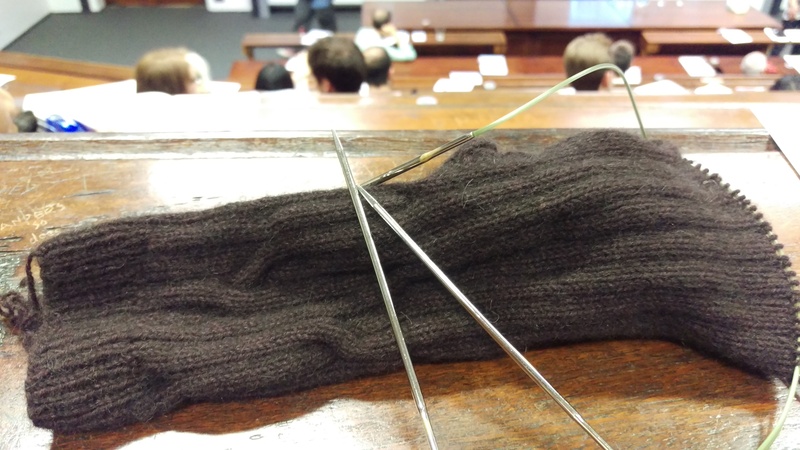 Here is the first sock, in the very incongruous setting of a public lecture theatre at Sydney University. It is in an old building and has all wood seating, all wooden desks and steeply raked benches with wooden doors. But of course it also now has fluorescent lighting and computer projection screens. 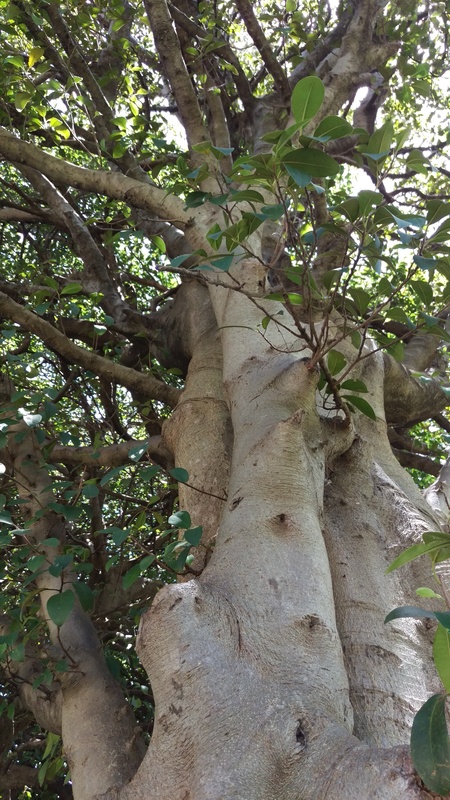 Outside I wandered off and away past beautiful Moreton Bay fig trees. 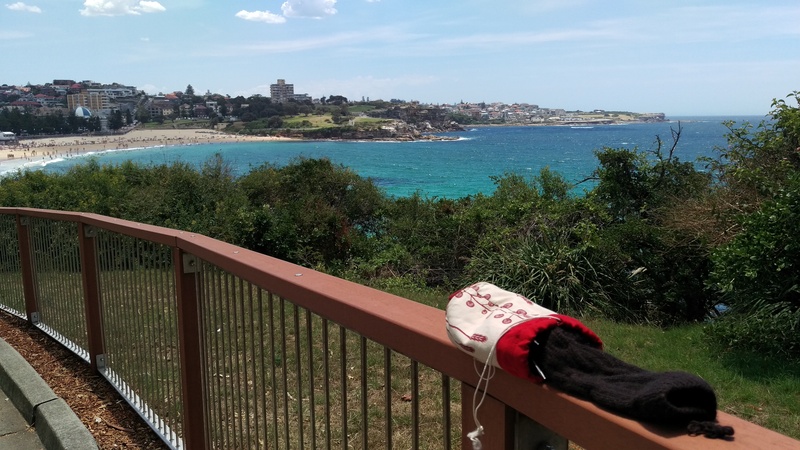 Here is the sock in progress beside the beach at Coogee. 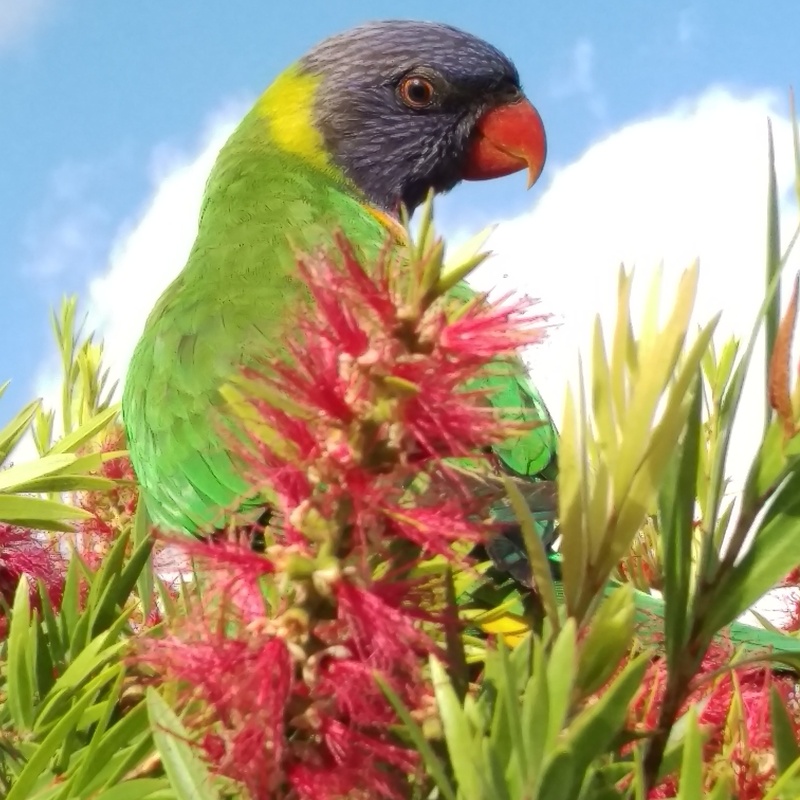 And here is a (random, bonus) rainbow lorikeet in Sydney, sighted when I was out for a run. I am not sure if this one was feeling bold or sleepy, but after all the times I have tried to photograph one of these birds and barely succeeded in getting a blur in the distance… here it is! Here they are in all their dark chocolate brown glory, ready for the feet of my beloved, when the summer ends and the autumn begins to ebb. She tried them on, the day I handed them over (yes, it was 41C) and they came off again pretty fast!!! 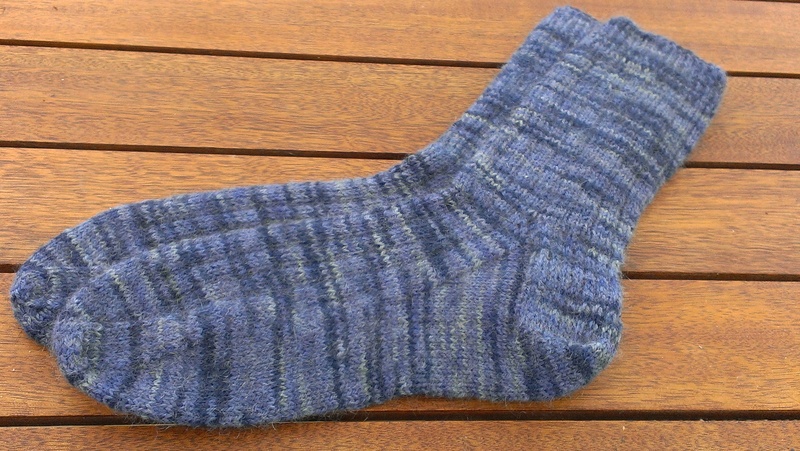 Back in the middle of the year, I invested in possum wool sock yarn. 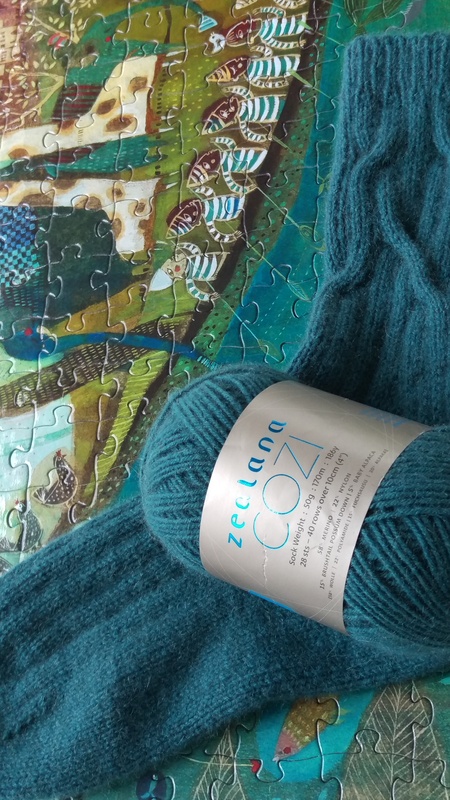 I have been knitting away… though I must admit the experience of losing the last pair on public transport has had me fretful for my own carelessness! The second pair are blue. I clearly didn’t take any really early pictures. But here we are on a houseboat, where friends have been working on (above) tea and treats and (below) a puzzle. I’ve finished the first sock and here is the ball that is to become the second sock. 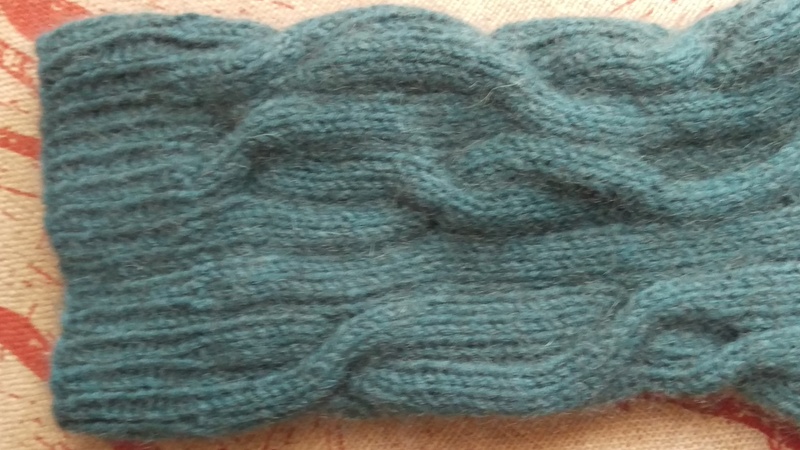 The pattern is what my dear friend has named ‘whimsical cabling’. To put it another way, I cable when I feel like it, in whichever direction seems like a good idea at the time. Once upon a time, I cast on a lovely pair of red socks, from possum wool. They had an intended recipient and unusually, I had told her they were coming. Here we are on the way to work on the bus. I am known to some in my workplace as the parsley fairy. Here they are on the way to the Newcastle Local Court, out of focus on the window ledge of the plane. And then, one day I went to a long series of meetings and was one and a half socks in, past the heel and on the home strait toward the toe… I remember seeing the bag with the socks in it on my office desk and thinking I should pack that to take home. I caught an usual series of public transport home, and when I stopped to change from bus to tram and the tram was late, I got out my knitting. Well, I would have, but it was GONE!!!! I know you will understand I hunted high and low and contacted several different possible places a lost sock might be handed in. But I think I have to face the fact that my one and a half socks, wool, needles and bag… are GONE to who only knows where? But quite likely, somewhere where those socks will not be completed or warm anyone’s toes, sadly. 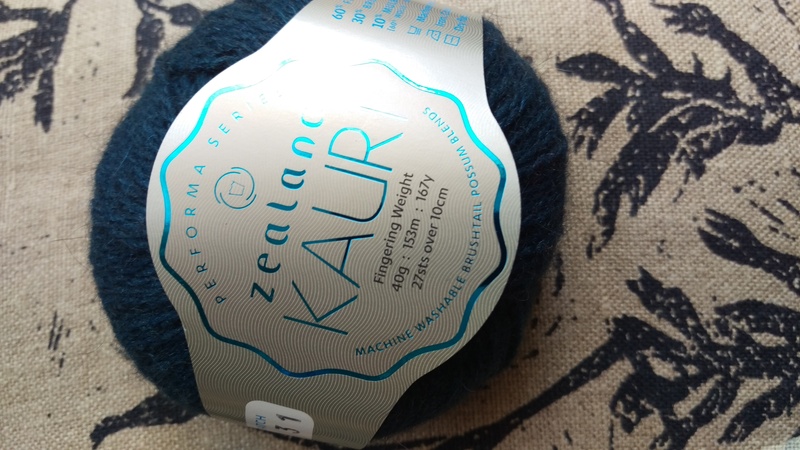 So, I fell off the knitting handspun wagon a bit in Aotearoa and I have been itching to cast on. I couldn’t wait and chose these aluminium dpns because I enjoy them in their shiny blueness so much. Then I, umm, free associated a pattern for some hand warmers. 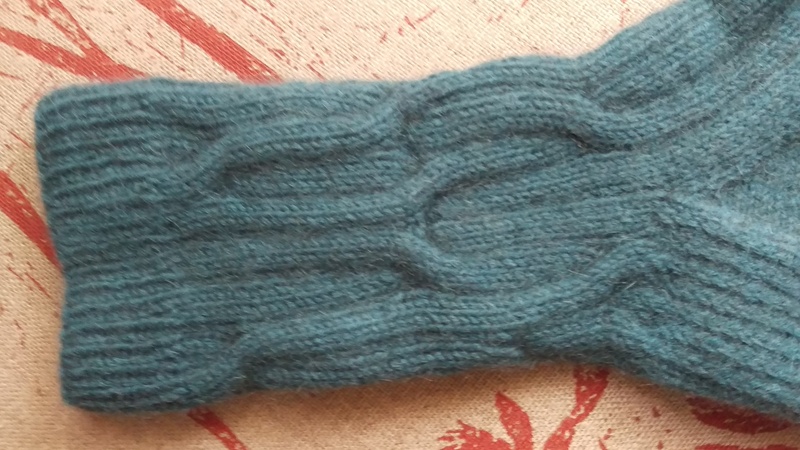 I realised when I reached the thumb gusset that I had given away the book I consulted last time I created a thumb gusset. Pretty quickly, here I am at the train station knitting a thumb gusset anyway. Then, onto the second! Some small crimes were committed in knitting the second and I had to rip it back and go again… so here is the second on a train..
And here they are ready for a short walk round to their new home. Plain but stretchy and delightfully warm. The very last silkworm went to silk yesterday, so there’s an end to silkworm updates for this year. I can’t pretend to be sorry. There have been a lot of weeks of feeding the hungry caterpillars multiple times a day and foraging on their behalf, and I’m happy to wait until next September to do that again. I found an extra two cocoons under the guitar case on the floor below the silkworm raising station. They must either have crawled there to pupate (music loving caterpillars?) or fallen after chewing off the piece of leaf that connected them to the rest of their mates. Happily, I don’t think we lost a single silkworm, which is good, since stories of silkworm tragedy came back to me from some of the people who took them home from the Guild! Meanwhile, a breakout of meetings and presentations at work has enabled the completion of these socks in Naturally Waikiwi Prints. I have only had them on the needles since August! While the other hemisphere is celebrating Wovember, here we have had our first days over 30C. These socks will be waiting a while to go onto a foot. They contain possum fur, which makes them delectably soft, while making use of the oversupply of possum fur in New Zealand/Aotearoa. Possums are incredibly cute, and as an Australian I am in a good position to know this because the possums in Aotearoa are feral. 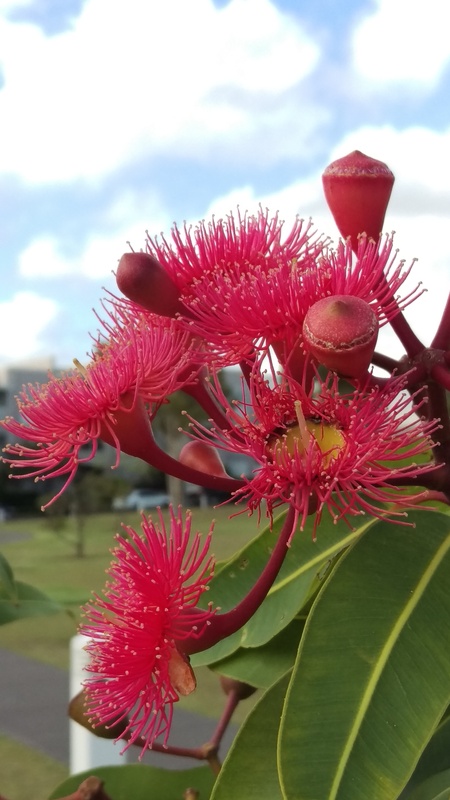 They are native to Australia. Without intervention, they would be well on their way to denuding those lovely islands and making life impossible for the plants and animals native there. Since Australia also struggles under the weight of feral animals (including cute ones like rabbits and cats), the damage that can be done is very obvious even if the sadness of having to cull them is equally clear. My apologies to any Kiwis who might be reading, for the introduction of our cute but damaging possums to your lovely land!